(CNN) -- Steve Yohanan loved having a cat around while he worked at home, enjoying how she put her head against his hand or purred in his lap. After his allergies acted up and he had to give the cat away, he missed the touch interaction he had with her and started thinking about how he could study these emotional responses to touch. 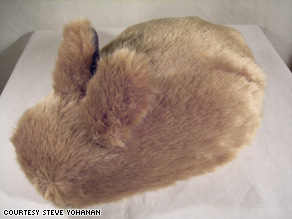 Researchers are working on making this bunny-like creature respond to petting and poking. Now, Yohanan, 40, a Ph.D. candidate in the Department of Computer Science at the University of British Columbia in Vancouver, has come up with a prototype for a robotic creature he'll use to figure out how humans use touch to communicate. A touch-based device like this could mediate communication between people in different places, he said. Although the research could have implications for robot pets, and that's close to what Yohanan is doing, he's more interested in using it to understand human-to-human communication. "I hope that this opens up interaction when you're dealing with social interaction, specifically kind of in a more general robotics sense, but also if you're dealing with mediated interaction, so if you're using technology to interact with another person," he said. The furry robot looks somewhat like a rabbit with no eyes, nose or mouth. Yohanan left off facial features because he wanted to exclusively study how people respond to the creature through touch. Although the creature can't move around, a person can feel it breathing and purring. The creature's bunny ears will also stiffen or relax, depending on how it "feels" in response to a human's touch. When the project is complete, it will be able to recognize the type of interaction -- petting, poking, squeezing -- and respond according to how it feels, Yohanan said. For instance, if the creature is happy, it will breathe in a fast, rhythmic motion, and its ears will become stiff and perk up. The "purring" response does not involve animal-like sound but rather vibrations that can be felt. The creature's high-resolution sensors will pick up information about how and when touch occurs, as well as how forcefully and in response to what, said professor Karon MacLean, Yohanan's adviser at the University of British Columbia. When finished, the creature will be fully autonomous: It will be plugged into a computer, but it will generate responses without the researchers dictating its moods. Yohanan imagines that the creature might lead to the development of a robotic pet that could connect couples who don't see each other often. For example, a wife who works different hours than her husband could convey her mood through touch to the creature, and the husband would sense that mood through the robot when he came home. "The person knows, oh, well, Steve's in a good mood today," he said. In technology, the field of haptics, or the study of touch, has been an active research area. It typically deals with copying the feel of an object onto a computer display, said Jochen Lang, associate professor at the University of Ottawa, who studies haptics. Although a lot of work has been done on simulating the way objects feel, Yohanan's project seems novel in its approach toward emotions and touch. "That's a fresh idea to look at it from an emotional point, how you could form a bond from what kind of haptics you displayed," Lang said. In the first phase of Yohanan's research, he created a robot that looked like a pillow with small ears, which humans operated by pumping air into it. Most participants in that study recognized "happy" responses as happy and "unhappy" as unhappy. Most participants reported that they had fun interacting with the pillow-like pet and responded most dramatically when the creature directly reacted to them. One person felt negatively about the experience, reporting that it was "kind of creepy," Yohanan said, which still reflected some kind of emotional shift. In the next phase of research, participants may wear blindfolds and ear covers in some studies to isolate the touch interactions, Yohanan said, but in other studies, they will not. He hopes to finish the new creature and start doing the next set of studies this summer. In the long term, he hopes to study how people bond with the bunny-eared creature over longer periods of time. A primary motivation behind the research is that in today's world of e-mail, cell phones and chat, touch seems to be dropping out of the picture. "There is a huge amount of evidence showing that interpersonal touch is extremely important to mental and emotional well-being, and absolutely critical in childhood development and for people who are ill," MacLean said. "By understanding better what touch is actually contributing, we'll eventually able to build some of this into the technological mediation."